"The Origin of Plastic Man"
Osiris and a very hungry Sobek journey to the Rock of Eternity because Osiris believes his powers are cursed and they are what made him prone to murder, and are the cause of the plagues befalling Khandaq. The entrance behind a statue, Osiris speaks the Wizard's name and the pathway opens, revealing a winding staircase with lit torches. They are shortly before the feet of the Marvel Family in the main hall. Captain Marvel Jr. informs Osiris that because he murdered that member of the Suicide Squad, the Teen Titans are now under investigation for ties to terror cells. Marvel tells him that he allowed him entrance to Eternity only because the Seven Deadly Sins of Man told him not to, proving his soul is pure. Osiris then states his case, and that he wishes for Captain Marvel to remove his powers. Adam, as he and Iris�enter the Rock,�objects on the grounds that the powers were a gift rather than a curse and tells him off for coming here when their country is in peril. Osiris accuses him of causing Khandaq's suffering and his own, sealing it with a hard blow that knocks Adam into the Greed statue behind him. Osiris is convinced Black Adam's powers have given him back his legs at the cost of his soul. Before the ruler of Khandaq can retaliate, the Marvel family restrain him, and Marvel insists he controls himself lest he accidentally damages the Rock to the point where the Sins will escape onto humanity. He further threatens to banish him to the Rock of Finality if he does not control himself, promising to tell Mary about it when she's older. Osiris then attacks CM2, but accidentally strikes Isis behind him. Finally shocked to his senses, he listens to his sister as she shares the pain she feels for their people, and that their abilities enable them to seek out whatever evil's infested Khandaq and expel it. Brother and sister hug, then Adam, now calm, tells him that he's proud of his willingness to accept responsibility for his actions and that it was Osiris who inspired Adam to become a better man. Osiris promises he'll try to do the same. Sobek still complains about his hunger. In deep space, yellow aliens with enlarged heads graft Animal Man with morphogenetic material, then reinserts him into the continuum. He awakens to find those same aliens standing around him while he starts to panic; he's been abandoned by his friends and now he's losing the space dolphin abilities he siphoned off of Lobo's friend. The alien points to the stars, but Buddy doesn't understand. As blood flows from his ears he takes out the photo of his family and magnifies his scanning ability to the point where he's able to pick up on the DNA of brain-shaped creatures called "sun-eaters." The abilities granted not only include breathing without air, but also a homing ability and migration maps in his mind. Elsewhere, aboard the Stygian fleet, the pregnant woman from Varduk starts to go into labor. What is born is a black-skinned hissing alien. Back in Khandaq, at the palace, Sobek finds Osiris, noting he thought he was going to meet up with Adam and Isis in an effort to dig up a new river. Osiris has decided he's going to leave�Khandaq, noting what he said back in Eternity was said only because it's what the others wanted him to�say. He decides as long as he has the powers he needs to�keep his�distance from those he cares for. Sobek suggests saying�Black Adam's name and relinquish the abilities, but then realizes without the powers of Osiris, he'd be a cripple again.�Osiris decides that is his penance if it will rid Khandaq of the disease and famine. Osiris does so, and in a flash of lightning he's transformed back into his human form, once again paralyzed. He notes the voices of Adam's gods are gone and is confident he can be happy once more and so will Khandaq. But then Sobek goes savage and proceeds to eat him, faster before Osiris can say "Black Adam." Sobek then notes that he's not so hungry anymore. A thief cracks open a safe and digs up the files on Plastic Man. As a thief, Patrick "Eel" O'Brian tried to commit a multimillion dollar theft from the Crawford Chemical Works. During his escape, a guard shot O'Brian in the arm. He stumbled into a stack of barrels, one breaking open and releasing an experimental acid on his wound. His gang abandoned him and he collapsed. Awakening in a church, O'Brian found that the acid that seeped into his wound altered his DNA and gave him the ability to bend and stretch his body like plastic. Thanks to the spiritual guidance of the monks who nursed him back to health, Patrick turned over a new leaf, choosing to use his powers to fight evil. 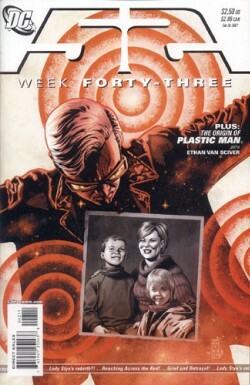 He would infiltrate gangs as his criminal identity, then set up their capture as his new persona, Plastic Man.�A special branch of the�FBI recruited him to help collar known offenders, all the while ensuring Eel O'Brian kept out of Plastic Man's grasp to the disgruntledness of Chief Branner. O'Brien's known allies include the indestructible sidekick Woozy Winks, and his own son, Ernie, who inherited O'Brian's abilities as Offspring. Few know about O'Brian's past. Main Story - 4: The Black Marvel Family story just became a lot more interesting. For a while it seemed as though Black Adam was turning into a carbon copy of Captain Marvel, but now it looks as though his world is about to become much darker. I'm unclear as to why Sobek went feral after Osiris rid himself of his powers. Had the hunger finally gotten to him, or does it have to do with Osiris' transformation? The confrontation in the Rock of Eternity was brilliantly written. You truly feel for Osiris, and it's not hard to see him as a Billy Batson without the Wizard to guide him. All this power at such a young age is too much too soon and already he finds it coincidental that his home is beset by famine, plagues, and natural disasters. It's not a mystery to the readers that the Horsemen are behind this, and it will now be interesting to see Isis' reaction to Sobek eating her brother. I truly hope Osiris isn't dead because he could very well become a major player in the DC-versed, perhaps even DC's answer to Spider-Man. Captain Marvel was truly seen as becoming�the Wizard,�demonstrating more knowledge about the powers at his disposal and wielding his authority towards Black Adam. The side story with Animal Man is a nice little intermission to the main plot in Khandaq. With these enhanced abilities it'll be no small mystery as to how he'll catch up to Starfire, Strange, and Lobo. His story is a testament to the human spirt; desperate to reach his family he's willing to go beyond his limits to survive. All in all the writing was much tighter than it has been in the past few issues. Osiris' struggle with his abilities has been ongoing and as I said I hope this isn't the final curtain for him. But then again judging from how bad Sobek left him I think I'm getting my hopes up. Art - 5: Dan Jurgens and Rapamund were fantastic. The angles and designs for the main players this issue were brilliant. Isis looked as powerful as she is beautiful. His design of the Rock of Eternity was classic and well done. The shot of Marvel on the throne surrounded by CM2 and Mary Marvel was iconic, as well as reminiscent of the tension Billy may still harbor towards Freddy for his feelings towards his sister. The only weak shots were in the Animal Man story. The side shots were good but you could've shown Buddy going through more agony; I mean the guy was in space and losing his ability to breathe. Other than that good job, guys! Back-Up Story - 5: This was a first for the origin section of the book; a story within a story... within a story. Having Plas disguise himself as a safe was brilliant. The setup was very characteristic of the hero's world, especially the last shot of the theif making off with the files and Plastic Man turning out to be the safe he just cracked. Hilarious. It was also similar to the Justice League Secret Origins Promo that Paul Dini and Alex Ross did as a promotional gimmick for the JLA story they did together. Great way of breaking the monotany, Waid! Back-Up Art - 5: Ethan Van Sciver brought a much-needed dose of realism to counter-balance this character's whacky personality. It's clear he went for an homage to the original story from the angles he used. The only cartoonish feature of that entire story was Woozy Winks. But other than that it was great art for this isssue. Cover Art - 3: I don't know what Sinclar and Jones were thinking, but they make Animal Man appear to be the main focus of the book. Then again the Death of Gwen Stacy issue in Spider-Man didn't hint at such an ending either. Don't get me wrong it's a great visual, but it only decieves the reader as to what the primary focus of this week's issue was.